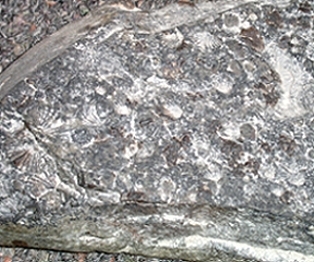 "The one fossil shell type appears numerous times (see photos below) in this left photo and only one single occurrence of another kind in the right photo. I have isolated the 2 fossil patterns (Above photos) in these 2 photos. Left photo ( Shell #1) seems like an Scallop style, but in right photo (Shell #2 ), I have no idea of was creature it was or how old any may be when there were fossilized. In both cases, the fossil patterns are 3 dimensional, not a flat imprint. " I'm interested in determining what they are and about how old they are. The photos are from the same rock I found in Maine." 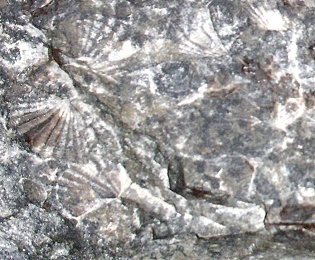 The scalloplike fossils are not mollusks but brachiopods. See the typical sulcus in the center of the valve at left? The genus is somewhat reminiscent of Eocoelia (which is Silurian), but to identify most brachiopods, you really must see internal features such as the hinge and muscle scars. 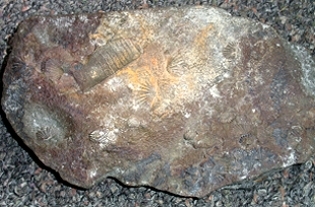 The "nonmolluscan" fossil is probably a nautiloid. The modern ones are all coiled, but many Paleozoic forms were straight. #1: Spiriferoid brachs indeed... a very speciose group with a long history, dying out in the middle or late Jurassic.